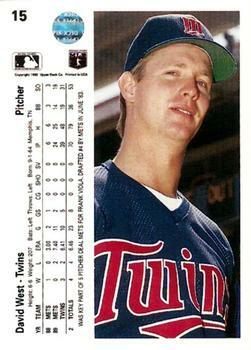 Hold for the shocker of the century…Len Dykstra has hockey blood in him. Is anyone really surprised? I read the back of this card and was like yep that makes a ton of sense. Dykstra reminds me of baseball’s version of Tie Domi – someone who was willing to abuse his and your body to ensure victory…someone with a huge honking wad of chew in his cheek, scratching, and spitting. Basically, your everyday fire and brimstone igniter player. My empirical sense of Dykstra was corroborated by an objective view of his career. Dude finished with a .375 OBP and had three seasons with an OBP over .400. In 1993, he led the Phillies and league in runs, hits, and walks. Hits and walks in the same year – that’s absurd. Basically, he got on base and caused damage. Unfortunately, perhaps because of his continually aggressive play, his body never let Dykstra join the upper echelons of baseball history. He only managed 1,278 games over 12 seasons. 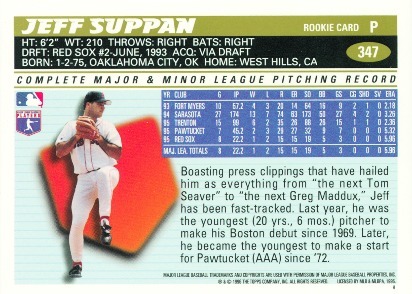 His last season, 1996, he played in just 40 contests, but managed a .387 OBP. He was also part of a pretty poor trade by the Mets. 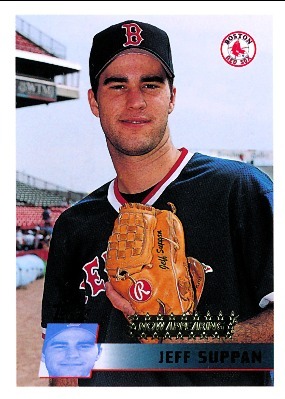 Along with Roger McDowell he was sent to the Phillies for Juan Samuel.